UConn Stamford was founded in 1951, to provide education for GIs returning from the Korean War. It is currently located at One University Place, at the corner of Washington Boulevard and Broad Street in downtown Stamford and is easily accessible by car, train, or bus. National Geographic just ranked Stamford number 8 in the top 25 happy cities in the country. The campus offers four-year undergraduate degrees in a number of majors: American Studies, Business and Technology, Digital Media Design, Economics, English, General Studies, Human Development and Family Studies, History, Political Science, and Psychology. At the graduate level, the campus offers the Master of Business Administration (MBA), Master of Business Analytics and Project Management (MSBAPM), and the Master of Science in Financial Risk Management (MSFRM) degrees. The Stamford campus’ location in lower Fairfield County provides access to internships, field placements and jobs with Fortune 500 companies, investment and banking institutions, non-profit organizations, and civic, education and community agencies. Kiplinger’s Personal Finance ranks UConn a “Best College Value” among top public colleges, saying that “students can receive a stellar education without graduating with a mountain of debt.” And with most of our students receiving financial assistance, we agree. Our goal is to make a UConn education affordable to each incoming student. The Welcome Center is located on the 1st floor of the campus building at the corner of West Broad Street & Washington Boulevard, and is open every Monday through Sunday. Saturday – Sunday: 9:00 a.m. – 2 p.m. The Welcome Center is the first point of contact for most visitors and members of the campus community. Services provided are: daily campus activity schedule, guest pass for shuttle bus, campus schedules, handouts, lost & found, and much more. The staff can also communicate to technology services, facilities and custodial service requests to the appropriate personnel. The Welcome Center serves as the focal point for social, cultural and recreational and day-to-day activities for the entire campus community. Students, faculty, staff, visitors and alumni all come to UConn Stamford for a wide range of programs and events. It is our goal to provide and maintain friendly service that fosters a warm and welcoming atmosphere for vibrant campus life. Please feel free to come visit us and enjoy our beautiful campus! It is very likely the campus building will be on a shortened schedule during spring break week (3rd week in March), Thanksgiving recess, and the break at the end of the year between Fall and Spring semesters (mid December through mid January). Please call 203-251-8514 if you have questions. Campus Police must be notified to ensure that the building is open for a specific event or individual. They can be reached at (860) 486-4801. In 1951, the University of Connecticut began offering extension courses at the former Stamford High School. In fall of 1952, the University formally established a regional campus in Stamford. Upon inception, UConn’s Stamford Campus offered five courses — English, Mathematics, History, Speech and Sociology and enrolled 21 part-time students. In 1990, planning began for a new UConn Stamford Campus in the heart of downtown Stamford. One of the first UConn 2000 building projects, the new state-of-the-art campus opened in 1998, offering a variety of academic programs including undergraduate and graduate degrees. The contemporary glass-enclosed campus features a high-tech approach to learning from desktop computer stations in our main computer lab to integrated online computer accessibility in our classrooms, laboratories and public spaces. Located among Fortune 500 business headquarters in the heart of downtown, UConn’s Stamford Campus partners with many corporate leaders and offers students valuable hands-on work experience. In collaboration with area businesses, UConn’s Stamford Campus established the CITI program, a full-service resource center that provides IT professional development and cyber-business research. The History of Our Campus’ Urban Park. 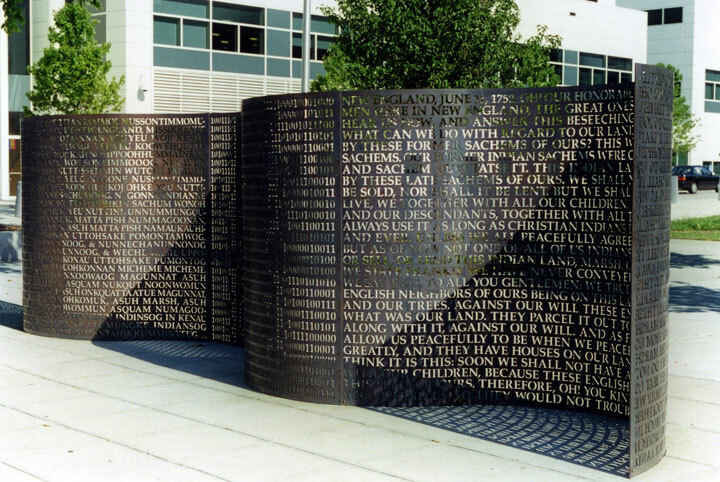 Artist: Jim Sanborn; best known for creating the encrypted Kryptos sculpture at CIA headquarters in Langley, Virginia. Additional Description: A bronze sculpture is located within a mini-park designed by Jim Sanborn that links Stamford’s past and its future. A walkway edged by massive granite slabs is suggestive of the name given to the city by early indigenous peoples: Rippowam, or “Cliff of Rocks.” The serpentine bronze screen contains a passage from Native American lore in English, the Algonquin language, and the binary “language” of computers. Park Naming history: The Park is named in honor of L.C. “Whitey” Heist, who led the initiative to establish the downtown University of Connecticut Stamford Campus. He was President of Champion International Corporation (which is now part of International Paper) — a Stamford-based corporation that believed companies had a responsibility to its community — and supported myriad community efforts–as well as corporate voluntarism. It was a great company — and Whitey was dedicated to both UConn and Stamford Hospital (he was board President of the hospital too).